Home visiting has been shown to improve outcomes for kids and parents, setting the stage for young children's future health and development. 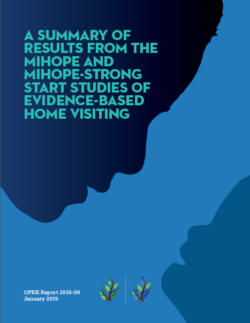 This brief summarizes reports from two national studies of evidence-based early childhood home visiting: the Mother and Infant Home Visiting Program Evaluation (MIHOPE) and the Mother and Infant Home Visiting Program Evaluation-Strong Start (MIHOPE-Strong Start). JBA is a partner in the MIHOPE and MIHOPE-Strong Start studies, both led by MDRC. The home visiting programs in both studies were generally well implemented, with appropriate support in place to help home visitors administer the intended services. This support included training for home visitors, supervision, structured parenting curricula, consultants to address specific family needs, and protocols for risk screening and referrals. However, the studies identified several ways that this support could be strengthened. MIHOPE found positive effects on some family outcomes, but MIHOPE-Strong Start found little effect on birth outcomes and prenatal behaviors. The findings from both studies are broadly consistent with results from previous studies of the evidence-based models of home visiting.